Belt buckle earrings western style. Are you into buckles? 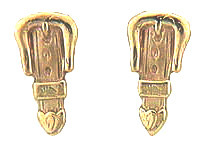 These earrings are pretty popular among the western style riders. Offering great detail in the design, you can match up your western decor with what else but western buckles. You can have these all high polished. Pictured is the satin finish.